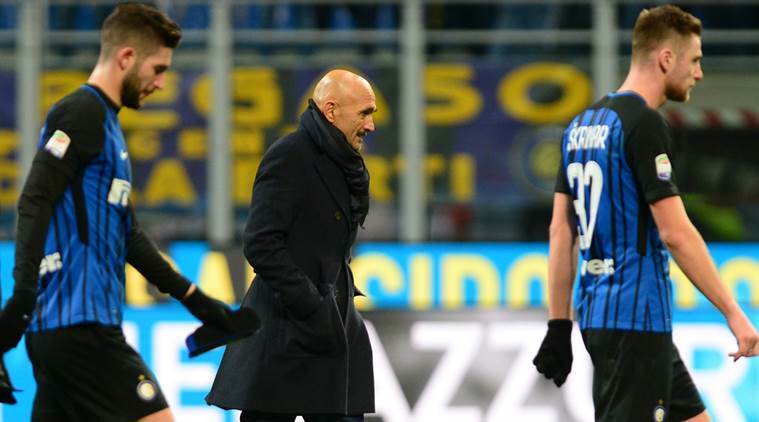 Inter Milan's crisis deepened as it was held to a 0-0 draw at home by Lazio on Saturday to leave it without a win in four league matches. "When you're part of a team like Inter there are no alibis or excuses, we just have to get good results," Inter coach Luciano Spalletti said. "For the moment we're meeting our targets, which means that the group is working hard." Three days later, Inter needed penalties to get past third-division Pordenone in the Italian Cup after a goalless draw. That was followed by league losses to Udinese (3-1) and Sassuolo (1-0) before Wednesday's surprise Cup defeat to AC Milan. It was the visitors who went closest to scoring at the end of the first half when Inter midfielder Borja Valero attempted to head clear Lazio's corner and it came off the crossbar. Lazio was awarded a penalty on the hour mark but, after reviewing the incident on video (VAR), the referee revoked his decision as Ciro Immobile's cross had hit Milan Skriniar's leg before bouncing up onto his arm so the handball was involuntary. "My appraisal of VAR is completely negative because it takes emotions out of football, now you don't even celebrate after a goal," Lazio coach Simone Inzaghi said. "We would've had an extra seven points this season without VAR." Dybala hadn't scored in the league since Nov. 19 but he restored Juve's lead in the 72nd and doubled his tally five minutes later. Earlier, former Juventus player Martin Caceres had canceled out Blaise Matuidi's opener. Benevento had the worst start to a season in modern history among Europe's five major leagues, losing 17 of its previous 18 matches in its debut season in Serie A.
Massimo Coda netted the historic goal for Benevento in the 64th minute, flicking Marco D'Alessandro's chipped pass beyond Chievo goalkeeper Stefano Sorrentino. Benevento picked up its first Serie A point at the beginning of the month when goalkeeper Alberto Brignoli's injury-time equalizer secured a 2-2 draw against Milan. Donnarumma made several crucial saves, notably palming Gil Dias' header onto the crossbar from close range in first-half injury time. Hakan Calhanoglu scored for Milan to cancel out Giovanni Simeone's opener.